In stock - low quantity. Order in the next 7 hours, 55 minutes and it will go out today! From France's Duraty comes this funny, magical, entertaining routine for children and adults alike! The magician displays four jumbo cards, each depicting a piece of cheese. 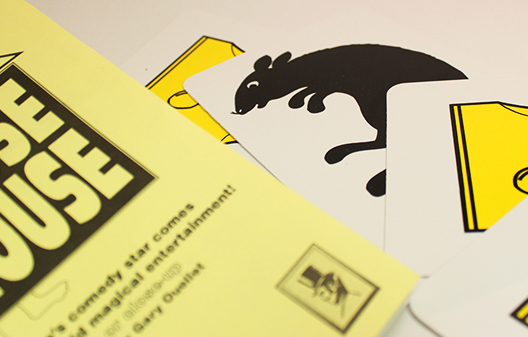 A fourth card is introduced, depicting a rather pesky mouse. Somehow, throughout the the routine, the mouse continues to change places with pieces of cheese, each time more impossibly than the last! Finally, the mouse disappears entirely, only to be replaced by a picture of a cat! These colorful characters are printed on credit card stock to last a lifetime, and the effect comes complete with Duraty's professional presentation in a fully illustraded booklet.